People associate Lawang Sewu, one of the famous landmarks in Semarang, with horror stories. The urban myth says that the historical building is haunted. Located at Jalan Pemuda, Semarang, in front of a hero monument call Tugu Muda. The three-story building, along with the surrounding area, was a witness to a long and perilous history. Lawang Sewu is built by the Dutch in 1907. The Dutch have used this building as its central office for East Indies Railway Company. During the World War II, Lawang Sewu later occupies by the Japanese. As their transportation headquarters. Its basement converts into torture rooms and a prison. In 1945, the building was a scene for a bloody battle. Lawang Sewu begins to get its haunting reputation. After decades of neglect, Semarang government rebrand Lawang Sewu. Precisely in 2011 as a tourist destination. A series of work and renovation has been done to eliminate its former horror reputation. And making it a hub for cultural activities. A portion of the building also serves as a museum, the Indonesian Railway system. Lawang Sewu is an architectural masterpiece. Their art deco style combines Dutch colonial architecture with a tropical practicality. Doors and large windows line up on its high wall rooms. Design specifically to circulate a good air flow. Particularly during the hot climate. This structure inspires its name, that means a thousand of doors in Javanese. The lobby area adorns by the stained glass. Refracting morning lights beautifully. The stained glass portrays two Roman Goddesses, Fortuna and Venus. Facing the logo of The Dutch Railway Company. The building material mostly imports from Europe. The granite stones for the floor coming from a mine in Bavaria, Germany. Plan hours to explore every detail of the interior. Even a strange corner of the building has its own interesting story. Or in some cases, horrors. Take a look at the basement in Building B. Where its use to be a torture room and a prison. A tour to Lawang Sewu can really result in a spectrum of emotions. The beautiful architecture of Lawang Sewu witnesses plenty of dark history. Imagine a group of soldiers go and about between Lawang Sewu’s high roof corridor. Prepare for the battle. During the five-days “Battle of Semarang” in 1945, the Sewu building is a site where bodies fall. Many soldiers captured and prisoners executed. Visit Lawang Sewu on 14 October. At this date every year, Lawang Sewu host a theatrical show to commemorate this battle. Trace back the history of trains in Indonesia since the Dutch era to present days at Lawang Sewu. Before the wars, Sewu was an office for a railway company. Many types of equipment from that era remained. It includes a large collection of typewriters and calculating machines. At the front yard, a steam train locomotive is on display. The first railway line in Indonesia was built in Semarang. Learn a number of ancient stations in Indonesia. There are pictures of trains, railways, and the constructions of Lawang Sewu itself. Lawang Sewu Railway Museum also keeps a collection of old train’s spare parts and tools. To get more in-depth information, visit the library and the archive room. People coming to Lawang Sewu and expect a horror experience might as well get prepare to disappoint. The building is open until late in the evening. However, the spooky feeling that once radiate through Lawang Sewu’s doors. It now completely gone. As it turns out, Lawang Sewu at night is breathtakingly beautiful. Enjoy the sparkle coming from bright, colorful lamps at the building’s every corner. The lighting enhances Lawang Sewu’s already remarkable architecture. Take a slow walk on its corridor in a dreamy evening. Occasionally, recognize a heartwarming scene. As couples having their pre-wedding photos taken at this building. Lawang Sewu had witnessed too many tragedies in the past. It is time for some warmth and romance. The good news for visitors, it has long operational hours. The heritage building opens daily for visitors from 7 AM to 9 PM. The ticket is unbelievably cheap at IDR 10,000, and they charge the same both for locals and foreigners. It offers a guide service at IDR 70,000 for an hour tour. A guide is not required but considering the buildings rich history. Having a guide can be very helpful. Besides, guides here also like to tell the horror stories. See: Dieng Plateau, Guide To Temple, Lake & Other Activities. Lawang Sewu has clean and well-maintain toilets. Parking is spacious, and there are also a nursery room and a smoking area. Hungry visitors can find food and drinks at the canteen here. There’s also a library and an archive room. The city Semarang itself is accessible from any major city in Indonesia either by plane, bus, or train. The historical building located in the city center. And it’s very easy to reach. The building is in front of Tugu Muda roundabout. One of the busiest roads in Semarang. Visitors can go by taxi from the airport Ahmad Yani – it is close, only 6,5 km. 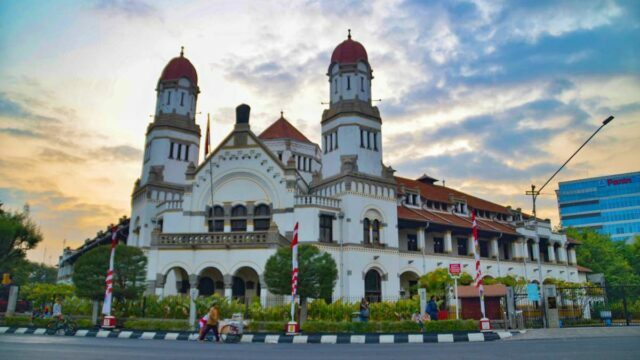 Lawang Sewu is only 3,5 km from Tawang Railway Station and around 7 km from Terboyo Bus Terminal. Other than using a taxi, visitors can take public bus Trans Semarang route 1 (blue line) and stop at Jl. Pemuda Shelter to get here.